Well making slow progress as our wind speed goes up and down like a roller coaster. The swells are changing from south west to south east making it more possible for them to crash over the rial and soaking us as we sail on watch. It is very muggy and hot, I am already for this little voyage adventure to be finished but it looks like 8 more days. Looks like a 1.2kts counter current we are working against too, hopefully that will change soon. Current Postion: 21* 29.2’N, 68* 21.8’W, UTC19:58, WS 18kts @180*M, COG 330, SOG 5kts, Really HOT! Once again on the ocean reaching for the far off horizon. I am surprisingly more comfortable not seeing land right now then I am back home siting on the couch watching TV or running around town. But as wonderfully as it is to see dolphin playing next to Dragonsbane once again, the pains of sailing in light wind and pitch poling well we go dead down wind is maddening. I hope that we will make landfall in 10 to 12 days we will see. Thought I should share this picture of Dragonsbane getting ready to sail 1500nm. In the back ground is a freighter loaded with sailboats for America. I guess we are not all the same kind of sailors. Hello again, it has been a few months sense I arrived back in the Caribbean Sea and not its time to make one last passage on Dragonsbane for at least myself Jacques. 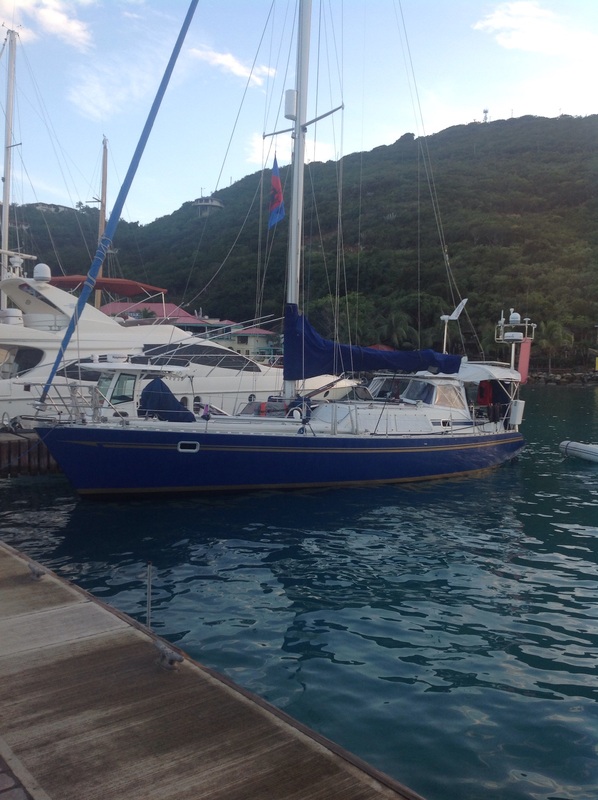 My dad Dale has asked me to help him sail from the St. Thomas US Virgin Island to Annapolis Maryland. My friend Carry as most you know will not make this trip so my dad and I will be making the voyage short handed. We plan on heading 1500 nautical miles straight to the Chesapeake Bay and then land in Annapolis. The current weather conditions look ok starting out in lit wind conditions and will increase throughout the 10 to 14 day passage. I will try and update you all as we make our way. Our total distance traveled from Cape Town South Africa was 6012 nautical miles. We used 15 gallons of fuel which works out to be 400 miles/gallon. We sailed for a total of 921 hours sleeping for 4 hours and then awake for 4 hours. That’s a average boat speed of 6.5 knots per hour. We saw 6 ships during our Atlantic crossing other then that it was all ocean. We broke one halyard, chafed through 9 sheets, blew out five panels in our spinnaker, ripped the drifted head sail, bent two snap shackles, lost two foil screws, fridge thermometer shorted out, spinnaker pole cats paw ripped out, leaked entire bottle of propane, throttle cable control broke, and beat the hell out of our bodies. All items above were repaired under sail and are functioning still. Cary and I both lost 20 pounds each and feel get. 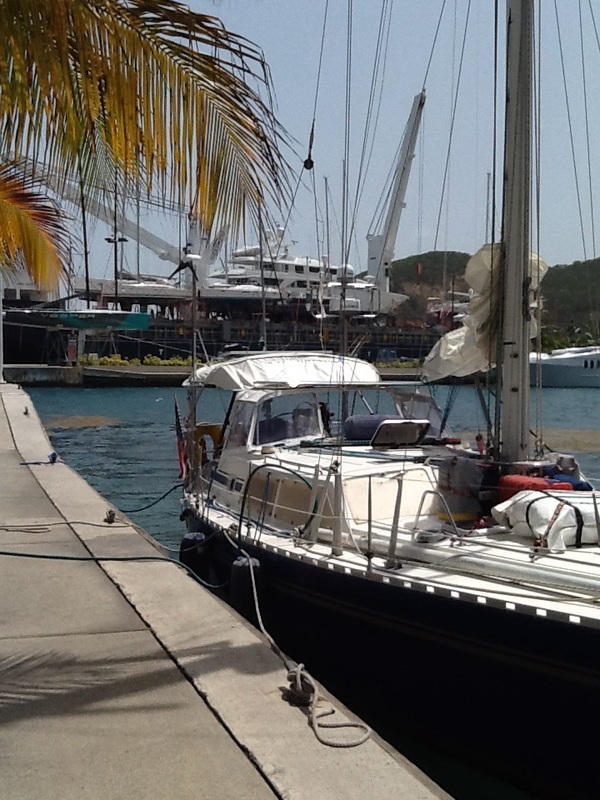 We ate almost everything aboard and landed in the BVI with just pasta and nasty can food. Our average wind speed was 22.3 knots, wave height 2 meters, and the biggest wave we saw was the two that broke over the top of the dodger. Our dodger is 10 feet from the water. Had dozens of waves wash over the entire for deck. All in all it was a great time. Its so unreal to be sailing back were I began two and half years ago. Its been a long haul and I am excited to have this 40 day passage under my belt. Cary and I are about 70 miles from Virgin Gorda BVI. We should make a landfall sometime tomorrow morning and hopefully clearance formalities will be painless. We are looking forward to enjoy a beer, burger, and then sleep for 8 hours straight for the first time in over a month. The wind is a bit on the lite side so I hope we can keep up our speed but we will see. Well its looking good for a landfall arrival on Thursday after noon. We are pushing up the windward side of the leeward Islands. We will enter into the Caribbean Sea north of Antigua and it should be a straight line to Virgin Gorada Island. We are making good time but dealing with a spattering of Squalls and micro gust that are making life hard. On a good note we caught a Mahe Mahe fish and had a great dinner.